Buddy Hayes, of Santa Fe, New Mexico, lives by the motto Desire to Inspire--and that she does! A former Ms. Wheelchair Virginia titleholder, Hayes is also a retired Certified Therapeutic Recreation Specialist, Special Education teacher, and Army veteran. She earned a degree at Tidewater Community College in recreation leadership and later a Bachelor’s degree in recreation at Virginia Wesleyan College. After graduating, Hayes worked with a wide variety of individuals with disabilities, from adults with brain injuries to toddlers requiring special education. This combination of education and experience ultimately benefited Hayes, herself, when she was diagnosed with multiple sclerosis (MS). Hayes said she first realized that something wasn’t quite right after a fall that resulted in a severe blow to her head. After being diagnosed with MS, Hayes endured long hospitalizations, therapy, and the need for long-term care. It was ironic that Hayes had always been one to provide services to individuals with disabilities and suddenly need those same services herself, yet she met her new challenges head on and with a positive attitude. An active and outgoing person, Hayes was not about to let MS defeat her. She worked on rehabilitating her body, despite many medical setbacks and continued to keep her spirits high. Today, Hayes brings her life experiences to others to educate and inspire them. A sought-after motivational speaker, Hayes travels nationwide to speak to audiences about coping with a disability. Using humor and anecdotes about her love of life, Hayes keeps the audience on the edge of their seats from the moment she begins to speak. In fact, when she competed at the Ms. Wheelchair America Pageant in Maryland in July 2007, she was awarded the Todd Mullins Courage Award for having the best platform speech. During her reign, Hayes’ platform was “Sports and Recreation for EveryBODY!" Both are things she is very passionate about. With her service dog Ellie at her side, Hayes made over 75 appearances over the course of her reign to educate and inspire people with disabilities to be all they can be. In an effort to continue her work and fill the need for presentations that were both positive and educational, Hayes founded Gimp Girls Rule Presentations. Through this initiative, Hayes strives to highlight what a person with a disability CAN do! Her extensive background in both therapeutic recreation and special education combined with wit and wisdom provide a powerful program. Her website, http://www.gimpgirlsrule.net/, also helps her spread the word of how a person can live with a disability and still have a fun and fulfilled life. Hayes also volunteers much of her time. Before being diagnosed with MS, Hayes was involved in her community and it was a challenge from her physical therapist that inspired her to stay active even after her diagnosis. According to Hayes, her physical therapist encouraged her to participate in a “fun run.” When she went to the local rehab hospital, she was dismayed to see she was the only wheelchair racer. Not one to quit, she did the race and, like everyone else, got a little nickel-sized medal upon finishing. It was this event that spurred her interest in racing on a higher level. Soon, Hayes joined Team in Training, which raises money for the Leukemia and Lymphoma Society. Once she had a coach, she then started training for her first half marathon, The Rock and Roll Half Marathon in Virginia Beach. Prior to that event, she trained hard and entered many local 5K races to prepare. Once the day arrived, Hayes was pumped up and ready to complete! The only problem was, she started at the back of the pack of over 6,000 runners. Because she didn’t have a racing wheelchair and was using a regular manual wheelchair, the race officials thought it was better she begin with the walkers in the back. Refusing to let that defeat her, Hayes pushed harder to pass by those walking and then even many of the runners to finish in the middle of the pack. Hayes commitment to racing ultimately earned her a grant from Challenge Athletes. She also managed to secure a racing chair, which was donated by a local business man, and she then set her sights on entering the Disney Half Marathon with Team in Training. When she began her daily training regime in her racing chair, it caused a bit of a stir since those in the neighborhood were not sure whether she was riding a bike or some other device. Soon though, everyone knew who she was and what she was doing! Then, sadly, just days before the Disney Half Marathon, Hayes’ father passed away. She attended the funeral and then flew out to Florida with her friend Ann at her side. Hayes had made a promise to her father to still do the race and two days later, she won the Disney Half Marathon in his memory. 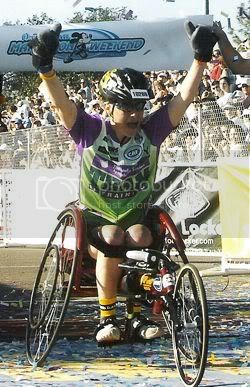 After winning, Hayes continued to compete in more local 5K races and, once again, participated in the Rock and Roll Half Marathon (this time in a racing chair), and she managed to win the Women’s Wheelchair Champion. Hayes knew that she was ready for a longer race--the marathon! Following a short break and then more training, she was off to Disney again to compete in her first marathon. Again, she was crowned the Women’s Wheelchair Champion, which she said was a real thrill. A few months later, Hayes competed in the Shamrock Marathon in Virginia Beach and was the Women’s Wheelchair Champion in that race as well. She then went back to Disney as part of the prize for being the Champion the year before, but was unable to compete in the marathon due to a shoulder injury. Not one to sit on the sidelines, she turned it into an opportunity to raise money for Canine Companions for Independence (CCI), from which she got her service dog Ellie. Hayes did participate in a “Pushin’ for Paws” 5K race, however, and managed to raise over $1,000 for the charity. Over the years, Hayes competed in three half marathons and one full marathon for Team in Training to raise funds and awareness for the Leukemia and Lymphoma Society. To date, she has raised over $13,000 for the Society in her Dad’s memory since he died from cancer. Although Hayes eventually retired from racing, it was not the end of her involvement in sports. Since she was not into sports before using a wheelchair, she feels as though she now has the chance to make up for lost time. One sport she now enjoys is skiing. Hayes learned to downhill ski at the National Disabled Veterans Winter Sports Clinic, which she has attended for the past five years. At the clinic, Hayes was also able to try scuba diving in a pool. The experience got her hooked and when she returned home, she found a teacher willing to work with her about an 1 ½ hours away. On weekends, Hayes met with her dive instructor Holly to learn the skills needed to earn her open water certification. After many lengthy lessons, Hayes was ready to test her skills in the ocean and, following a trip to the island of Bonaire for a week (and many dives later), Hayes earned her certification. The quietness under the ocean, the colorful fish, and the chance to see new things opened up a new world for Hayes. She says that being under water is true freedom—with no wheelchair and not feeling like she has a disability. Being an Army veteran has also brought about other sports related opportunities for Hayes, including participating in the National Veterans Wheelchair Games in Alaska in 2006. While there, she competed in five events, and she brought home five gold medals, including three for swimming, one for air rifle, and one for completing a terrain course that required she wear a helmet and be duct taped to her wheelchair! That event led to Hayes wanting to learn more about air rifle, but she was forced to put that on hold until after her move from Virginia to New Mexico and then because she became extremely ill.
Hayes began focusing once again on her special list of goals, which she refers to as her “Stroke and Croak list” and was reminded that she had listed going to the Paralympics as one of her dreams. Unsure of which sport would suit her best, she did some investigating and ended up getting invited to attend the Military Paralympics Summer Games Camp in San Diego. There, she was able to participate in swimming, sit volleyball, handcycling and conditioning as well as archery. Still drawn to air rifle however, Hayes decided to enter her local Senior Olympics and, much to her surprise, she won two gold medals in air rifle and air pistol. Hayes will now go on to represent Santa Fe in the New Mexico State Senior Olympics. She also earned an invitation to the USA Olympic Training Center for a special Paralympic Air Rifle Camp for the military in Colorado Springs this past March. Hayes was one of just 12 veterans from across the country to be invited to participate in this first camp of its kind. She said that having one-on-one instruction was thrilling. At the end of the camp, Hayes competed in her first USA Shooting Match and now has her sights set on the 2016 Paralympics in Rio. When not competing, Hayes spends much of her time trying to raise awareness and funds for the National Multiple Sclerosis Society. To date, she has raised over $7,000 for the Society by participating in her local MS Walks and MS Challenge Walks. In fact, Hayes was the first person to push a manual wheelchair unassisted in the Chesapeake Bay MS Challenge Walk, which lasted three days and was 50 miles long. Since moving to New Mexico two years ago, Hayes formed a team in her area and they became the second highest fundraising team at the Walk. Hayes also serves as a Walk committee member each year. Hayes’ commitment to serving the community has earned her numerous accolades, including the MS Leaders of Hope Award in 2005 and the Virginia Wesleyan College Alumni Award in 2006. Then in 2008, she was chosen as the Hero for CCI’s NE Region at the Hearts and Heroes Gala in NY. And, perhaps one of Hayes’ most exciting honors came when the Montel Williams Show invited her on as a special guest and Williams presented her with a trip to Disney World for all that she has done. While in Disney, Hayes was the Grand Marshal of the Disney Parade along with Ellie and her friend Jewel Bennett. To learn more about Buddy Hayes or to request an appearance, visit: http://gimpgirlsrule.blogspot.com/ or http://www.gimpgirlsrule.net/. I read this blog post somewhat late, but found it full of sound common sense and helpful thoughts. Okay, I think simply got a really good point. You certainly know truly speaking about, and I has the capability to unquestionably take in the carpet in which. Appreciate your sharing working the case beforehand as honest. his site is excellent and so is how the subject matter was explained. I also like some of the comments too.Waiting for next post.